The Hyundai A-League 2018/19 draw is locked in, with all of the Mariners' 13 home games to be played at the iconic Central Coast Stadium. Our new journey under Mike Mulvey begins on Sunday 21 October away to Brisbane Roar at Suncorp Stadium and our first home match will take place at Central Coast Stadium where we host Melbourne City on Saturday 27 October at 5:35pm. 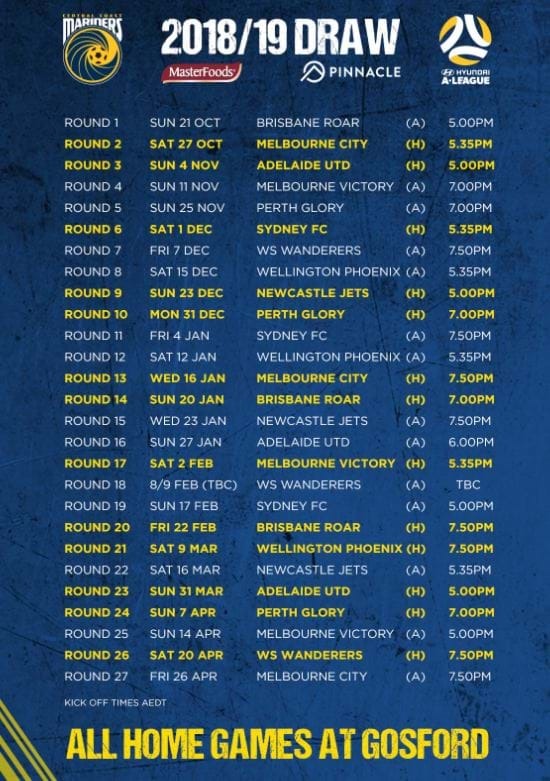 One of the most popular fixtures on the Central Coast Mariners’ calendar is the New Year’s Eve blockbuster. We host Perth Glory as we see out 2018, and aim to bring in the New Year with a win. When it comes to derby days, there are visits from our closest rivals on Saturday 1 December (5:35pm vs. Sydney FC), Sunday 23 December (5:00pm vs. Newcastle Jets) and Saturday 20 April (7:50pm vs. Western Sydney Wanderers). We’re on the road to Newcastle twice this season for the #F3Derby and with entry to McDonald Jones Stadium included in full season memberships, it’s time to book your seat on the bus for Wednesday 23 January (7:50pm) and Saturday 16 March (5:35pm). Our away fixtures against Sydney FC will be played at Jubilee Stadium (Friday 4 January) and Leichhardt Oval (Sunday 17 February).